The Royal Australian Navy’s (RAN) first-of-class air warfare destroyer HMAS Hobart has completed its weapons and systems evaluations, including a series of at-sea trials known as the combat system qualification trials (CSSQT), with the U.S. Navy off the U.S. West Coast in December, the service said in a statement. “The aim was to achieve a sustainable level of combat and weapon system readiness,” the report reads. 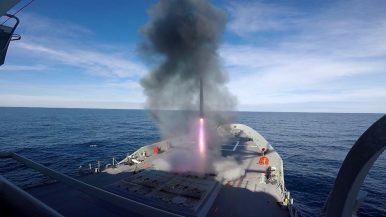 CSSQT included a variety of combat scenarios and involved demonstrating the ship’s ability to strike hostile aircraft and missiles. “We were presented with some of the world’s toughest and most challenging threats; modern anti-ship missiles, maritime strike aircraft, fighters and high-speed attack craft. On every occasion we successfully defended all threats,” the commanding officer of HMAS Hobart, Captain John Stavridis, was quoted as saying. In November 2018, HMAS Hobart conducted a test of the so-called cooperative engagement capability (CEC) real-time sensor netting system with the U.S. Navy Arleigh Burke-class destroyer USS John Finn off the coast of Hawaii. The test involved establishing secure data links and sharing tracking and fire control data between the two warships. The Hobart-class is the first class of Australian surface combatants to be built around the U.S.-made Aegis combat system and the first outside the U.S. Navy to be equipped with the CEC capability. CEC interfaces with the Aegis combat system and enhances its early detection capability. It is a new wide-area integrated air defense system that allows the real-time sharing of sensor data on air targets, including incoming enemy aircraft and cruise missiles between CEC-equipped destroyers. Total procurement costs are estimated at over [AUS] $8 billion, making this Australia’s most expensive weapons program to date. Approximately half of that amount has been earmarked for major upgrades following the ships’ commissioning. The first-of-class air warfare destroyer HMAS Hobart was commissioned in September 2017. The future HMAS Sydney, the final guided-missile destroyer of the Hobart-class, is expected to be delivered to the service in March 2020.